Just typing up this recipe brings back so many happy memories of Christmases past. For me baking cookies is a big part of what makes the holidays special. I've been in charge of holiday Christmas cookie baking since I was a kid. 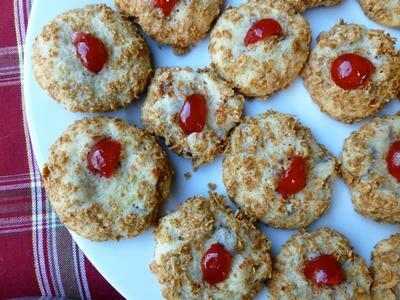 This recipe for Wheaties Cherry Blinks is an oldie but a goodie dating back to the original 1963 Betty Crocker Cooky Book, where I originally first saw it and tried it. They've become a holiday tradition ever since. I made a batch yesterday and my husband has been grabbing one every time he passes the plate. They're an old-fashioned not-too-sweet soft and chewy cookie with a nice crunch from the crushed Wheaties! Position an oven rack in the center of your oven and preheat the oven to 375F degrees. Lightly grease 2 to 3 baking sheets or for easy cleanup line them with parchment paper. In a large bowl, beat the shortening, butter, sugar and egg with an electric mixer until creamy. Stir in the milk and vanilla. Fluff up your flour with a fork or whisk and then dip a 1 cup measuring cup into the flour and level off it with a spatula. (Do not tap the cup or pack more flour into the cup before leveling it off.) Pour the flour into a medium bowl. Add the baking powder, baking soda and salt to the flour and whisk to blend everything together. Stir the flour mixture into the wet mixture just until blended and then stir in the raisins and nuts. Place the crushed Wheaties in a shallow dish. Drop the dough by teaspoonfuls into the crushed Wheaties. Roll around gently so the balls of dough are completely coated with the Wheaties. Place on the prepared baking sheets spacing about 2 inches apart. Top with a piece of a cherry, pressing down slightly. Like you, I have been baking these since the 1963 Betty Crocker cookbook included them. I used to make a big can of a variety of cookies for my husband to take to work. These were definitely included. They are my all-time favorite cookie for Christmas.